This came as a result of an experiment in my kitchen. 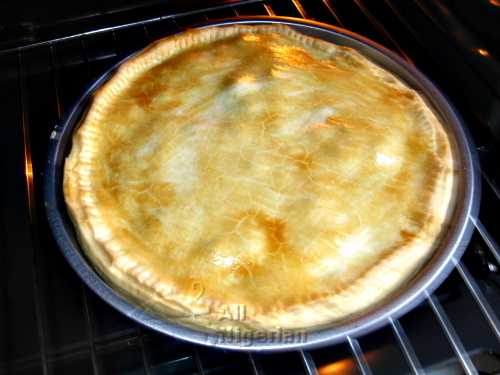 I wanted to jazz up my Nigerian Meat Pie because everyone in my home was getting bored with the conventional meat pie with its half moon shape. This one tastes so good and believe me, the first time I made it, a whole pan was consumed in no time! I only made a few changes to the original Nigerian Meat Pie to get this. I replaced the Irish potatoes with sweet potatoes and added sweet apple. These two add a kind of subtle sweetness to the meat pie. Then I used a flat baking pan to make it look like the western pies. 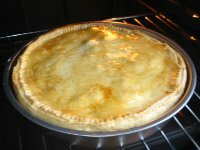 I used a baking pan that is 9 inches (23cm) in diameter and 1.5 inches (4 cm) deep. Wash, peel and dice all the vegetables. Do the same for the apple. Follow the direction for making Nigerian Meat Pie filling. After step 4 from over there, add the diced apple, add the thickener, stir and leave to simmer for about 3 minutes. The dough for this pie is mixed exactly the same way as the dough for the classic Nigerian Meat Pie. Follow the directions over there to mix the dough. Set your oven to 170°C (335°F) to preheat. Rub margarine on the insides of the baking pan. Break the egg, beat it and set aside. Knead the rested dough for a bit and divide it into 2 parts. One part should be slightly bigger than the other. Roll out the bigger dough to a 5mm thickness making sure that the diameter of the rolled out dough equals the diameter of your baking pan plus two times the depth of the pan and then some excess to allow for sealing the meat pie. Once happy, drape the flat dough on the pan and make it snug the inside corners of the pan. Fill the dough-lined baking pan with the filling. Brush some egg on the dough covering the edge of the pan. Roll out the remaining dough to 5mm thickness and a diameter that is a bit wider than that of the baking pan. Cover the pan with the rolled out dough and use a fork to seal the edges. Feel free to close the edges any how you like. Rub the egg on the dough. This gives the pie a golden brown look when done. Set the pan on a rack in the preheated oven and bake for 30 minutes or till the top covering is golden brown. Place the pan closer to the bottom heating so that the dough at the bottom of the pan will be well done by the time the top dough is done. Try this and you'll love it!